When Sean and I were on our honeymoon on Saltspring Island we had dinner one night at the Marketplace Cafe. The restaurant had great ambiance, delicious food and lovely service -but what really knocked our socks off were their steamed clams. Being from Seattle, I have had plenty of clams, but the broth on these was so rich and memorable that we had to ask the chef about the ingredients. Turns out the secret is sherry. Rinse and drain clams; set aside. Heat olive oil in large heavy pot over medium heat. Add garlic, dill, and thyme and heat until garlic is just starting to brown (about 2 min). Add sherry and water and heat until steaming (about 1 min). Add clams, cover pot and cook 5 minutes. Add butter and stir gently until well blended with juices. 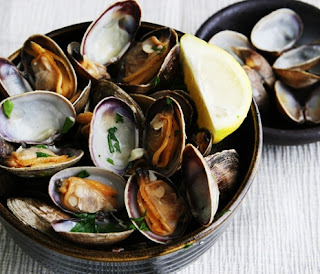 Ladle out clams into a large serving bowl. Remove any clams that did not open all the way. Pour remaining juices over clams. Serve hot with fresh bread on the side.